Palestinians in Bethlehem’s Aida refugee camp have expressed their mounting anxiety over a US decision to slash funding to the United Nations Relief and Works Agency for Palestine Refugees in the Near East (UNRWA). Thaher pays 4,000 shekels ($1,172) a month on treatment for his ill wife. He says that UNRWA does not assist him with the costs. Camp resident Jaida Abu Srour (image on the left), 22, told Mondoweiss that UNRWA’s Cash for Work program is central for the livelihoods of Palestinian refugees. The program hires refugees on a temporary basis to provide them financial support. Ahmad Abu Salem (image on the right), 59, owns a small shop in Aida camp. He says he is most concerned about the schooling and healthcare provided by UNRWA, noting that these are the most basic service provisions needed in the camps to prevent dangerous social consequences. 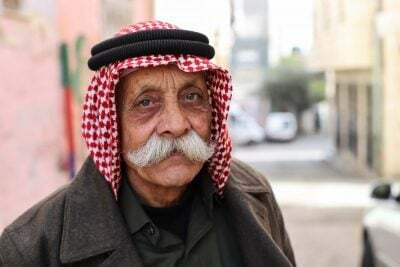 Abu Salem expressed fear that the slow collapse of UNRWA would create a vacuum of unemployment, prompting Palestinians to turn to crime to make ends meet. “We would have no jobs and nowhere to go. If these cuts continue the situation here could explode,” he said. Jaclynn Ashly is a journalist based in Bethlehem, Palestine. You can find her on twitter @jaclynnashly.